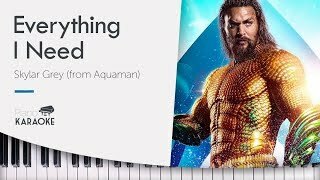 Instrumental karaoke on piano of "Everything I Need" by Skylar Grey, taken from the Aquaman Soundtrack. This version is in the same key as the original (Bm) at a tempo of 75 BPM. If you like this piano karaoke cover, we'd really appreciate a thumbs-up on this video! Don't forget to subscribe to our channel for more videos like this.